As a bride who has always appreciated nostalgia, this is the perfect keepsake. 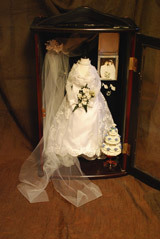 When I look into the box, memories of our beautiful wedding day come flooding over me... The miniature framed photo of the wedding party and miniature version of the invitation give it a touch of class. I'm glad I don't have to pull the dress out of storage to be reminded of its beauty! I wanted to thank you for the beautiful shadow box you have created for my husband and myself. it is so nice to have this to reflect on our special day... it is unique from anything we could ever find in a store... I cannot believe how exact my dress, tiara and cake are to the actual pieces... My husband and I will cherish it for years to come. I wished you could have been there to see the look in my daughter's eyes when she first saw the beautiful bridal gown keepsake you created for her... It was a spectacular sigt to behold. Everyone gathered around the table throughout the shower and couldn't get over it!!! The attention to detail, the quality and the artful craftmanship of your work is to be commended. My Aunt/Godmother had this beautiful reproduction of my own wedding gown. I love that the veil was also reproduced almost identically to my "Cathedral Length" veil. I know they can also go directly to the designer and get the exact fabric etc. for the really expensive dresses some girls have made or designed specifically for them. It's a treasure that I look at it everyday. It looks like a miniature version of my very own gown I wore on my "Special Day." The dress is beautiful. It came with a miniature photo of my husband and I in the back and a small table with a miniature of our wedding cake too. The case is "High Quality" beautiful mahogany wood. The door closes so the dust will not ruin the beautiful reproduction of my original gown. This is a "treasure" to me as my gown is preserved in a box and I can look at this reproduction everyday. This is one wedding gift I will treasure for the rest of my life.